(Bloomberg) – South Africa’s EOH Holdings Ltd. said the potential loss of partner agreements with Microsoft Corp.’s South African unit will hurt profit by about R10m ($724,000) and pledged to resolve the matter as soon as possible. 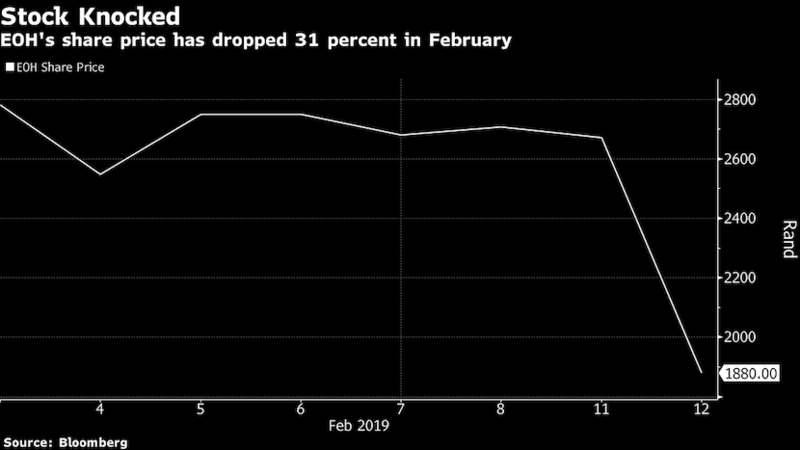 Shares in the Johannesburg-based technology firm plunged the most in more than a year on Tuesday after website TechCentral reported that Microsoft had moved to terminate the agreement, giving 30 days notice. While Microsoft hasn’t given a reason for the decision, EOH Chief Executive Officer Stephen van Coller has approached the US software giant to seek clarity, the company said in a statement. “EOH has initiated plans to ensure minimal disruption to customers and to limit the potential impact on the business, until more clarity has been obtained,” the firm said. EOH last year hired Van Coller, a former executive at wireless carrier MTN Group Ltd. and lender Absa Group Ltd., to try and shake off reputational concerns after the company was linked to questionable government contracts. But last month, state-owned power utility Eskom Holdings SOC Ltd. published allegations that its former chief procurement officer and other senior officials were involved in acts of misconduct that involved EOH. The technology company said later the same week that both of the Eskom’s allegations have been fully investigated and that EOH wasn’t implicated in any wrongdoing. EOH has hired a legal firm to carry out an internal investigation, according to Van Coller, who is due to meet with Microsoft later on Tuesday. The shares crashed as much as 34% and traded 27% lower at R19.54 as of 2:40pm in Johannesburg, their lowest since August 2011.